Jacqueline S. Chea Members of the Feminist Bird Club use their binoculars to zoom in on trees, hoping to find the bird whose calls they can hear. Karla M. Noboa, who founded and runs the Boston branch of the Feminist Bird Club, greets each individual birder as they arrive. She takes on the task of leading the walk with a hope that no one feels intimidated. Trudging through Mount Auburn Cemetery, the twenty-two assembled members of the Feminist Bird Club fall silent. There is nothing to be heard besides the wind rustling through the old trees, the shuffling of restless feet on withered leaves, and the possible presence of hundreds of century-old souls. With heavy sighs, the group continues down the path. One group points ahead to a bush. “What is this shrub?” one woman asks the arborists in the group. Most of these individuals — 20 women and two men — have met for the first time this Sunday morning, yet they fall into an easy camaraderie. Bird walking is very popular in the Eastern Massachusetts area, mostly due to migration paths and diverse bird-life from the coast line. But what makes this type of bird walking more feminist than regular bird walking? Experienced birders call out bird species every few minutes. “Brown Creeper!” “Sharp-shinned Hawk!” “Tufted Titmouse!” It can be overwhelming. Good spot. Walkers are supportive of one another, pointing out birds they see for newcomers, and passing around binoculars. Noboa carefully records every bird they see within a birding app called E-Bird. 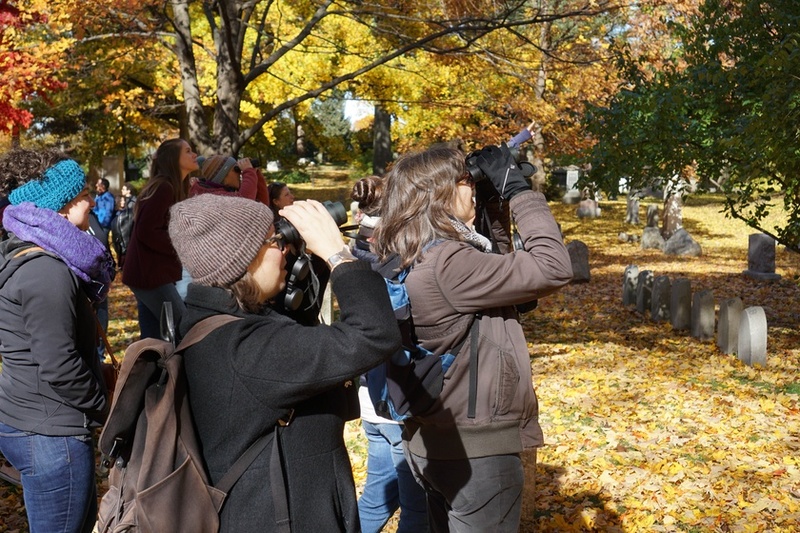 When Noboa first started searching for inclusive birding groups in Boston in 2016, Adams’ club in New York was the only one she found. Noboa reached out to Adams over Instagram to ask if there was a Boston branch of her club. There wasn’t, and Noboa decided, with Adams’ blessing, to found one herself. The club has since founded another branch in Chicago, with two more prospective groups in the planning stages. Noboa leads all walks herself, and limits them to around one per month, choosing a new location each time. 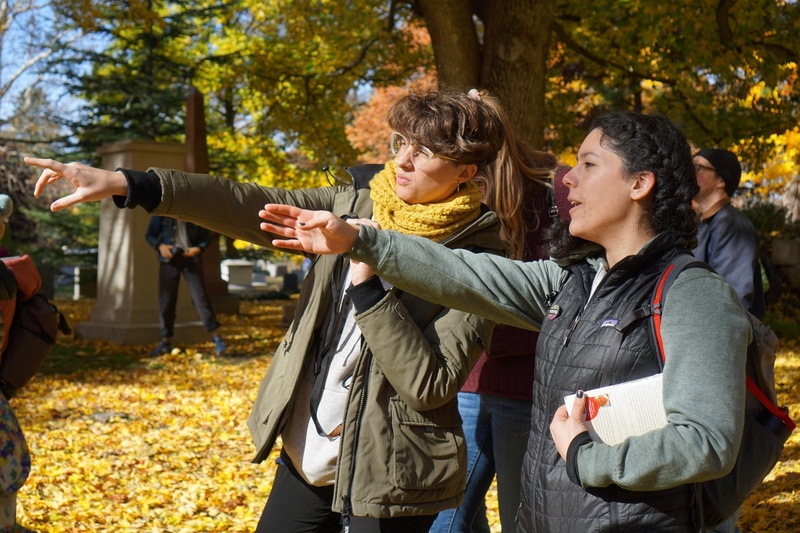 Mount Auburn is a huge stretch of land, and the group walks into the heart of it. Each of the paths has their own original name, lending the cemetery an oddly cozy feel. Walking down Mistletoe Path is like entering a different world — one where colors are brighter, footsteps are crunchier, and every bird is deemed special. A small, fat bird hops along the grave of the Scott family. This bird is the first real spotting of the day, and admiration arises for the tiny ball of fluff. Noboa admits it’s a “pudgy” bird, and the group laughs. Everyone stops every few steps, surrounded by a landscape of yellow and a sky of orange, searching for the slight movements of birds among the falling leaves. As cement statues of wealthy New Englanders from centuries past tower over the pathways, leaves rain down orange upon them. Their names are buried beneath the unstoppable fall foliage. Inés Patop, another newcomer to the group, was interested in the feminist aspect of the club. Patop is from Argentina, where she says feminist groups are popular, and she is in Boston to get a Ph.D. “I arrived a few months ago, and I was looking up everything I could find about any type of feminist activity,” Patop says. While searching online, she found the Feminist Bird Club. As with most birding clubs, the Feminist Bird Club is about meeting up, looking for birds, and socializing with fellow birders. But it wouldn’t exist without its focus on giving back. Each year, Adams designs and sells a bird patch and donates the proceeds to a different organization. This year’s patch sports the Spotted Sandpiper, and the club will donate proceeds to Black Lives Matter. Noboa calls this out several times. She emphasizes the silence, listening in the quiet for any bird calls. For this group, birding is active meditation, a way to reduce anxiety. And if regular birding intends to focus energy while maintaining patience, feminist birding aims to promote this meditation by allowing women to feel safe and included in their participation.